Why can’t scientists agree on Global Warming? 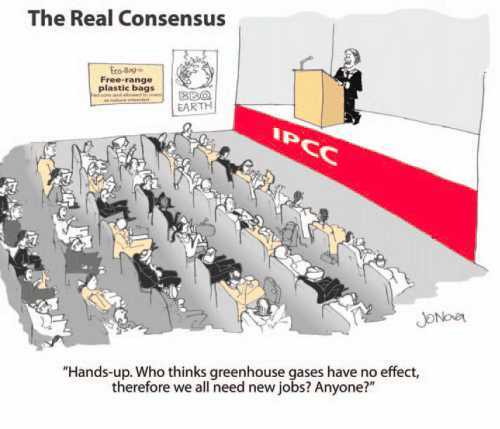 Click to go to the original cartoon, in The Skeptics Handbook, by Jo Nova. As both the title and the list of speakers made obvious, it was very pro-AGW, however I went along to see if there were any dissenters in the large audience and what sort of response they would get. The speakers were: Prof Glenn McGregor (Director, School of Environment), Prof Roger Davies (Chair in Climate Physics, Physics Dept), Dr Jim Salinger (Hon Research Associate, School of Environment), Dr Anthony Fowler (Snr Lecturer, School of Environment) and Dr Mary Sewell (Snr Lecturer, School of Biological Sciences).